For two decades Ned Evett, whether solo or with his band Triple Double, has been captivating audiences with his talents on electric and acoustic fretless guitar. 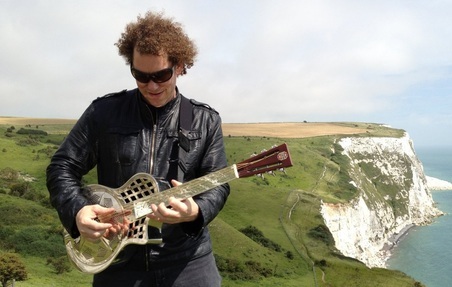 Nicknamed "the glass guitarist" (courtesy of his trademark mirrored glass fingerboards) and recognised as one of the best fretless six-string players in the world, Evett’s guitar abilities, song writing skills and baritone vocal meet and blend perfectly on Treehouse, his sixth solo album and strongest release to date. The Nashville born musician was over in the UK during the summer for a string of club and festival dates and that's where the following Muirsical Conversation started. Ross Muir: You’re currently undertaking a UK club tour, how’s that been going? Ned Evett: Well, I would say it’s been a big success; we’ve had a mixture of festivals as well as the clubs and the shows have been going over great. I really enjoy the festival circuit here in the UK; we played at the Maverick festival in Suffolk and also the Upton Blues festival at Upton upon Severn. Those were both really good gigs and appreciative audiences. NE: Oh that would be amazing. I’ve played in Scotland before; I played St Andrews and I’ve played the Ullapool Guitar Festival and I’ve really wanted to do a more comprehensive Scottish tour leg for a long time. But it’s just getting things to fall into place; I’ve gotten some offers for next spring, 2013, so we’ll probably start to work in earnest on that region of time almost as soon as I return to the States. I really hope Scotland is part of it. NE: It’s actually been a really funny combination of line-ups. There have been gigs where it’s just me, solo; there have been duo gigs where it’s just me and my percussionist Todd Chavez; then there’s been the Triple Double thing with myself, Todd and Malcolm Bruce on bass. So it’s been mixed between those three line-ups and it’s been really fun, but it also sort of depends on the scheme of the gig - for the larger festivals we’ve been tooling it for the band then for some of the more regional stuff and London we’ve been doing duo shows, or me solo. NE: Yes, and I write the songs exclusively solo, by myself. So the songs all start off at that level. it’s fun to perform them like that, but scaling them up from there is really fun, too. RM: One of the reasons you are over is to promote Treehouse, which came out earlier this year. Treehouse is, for me, your strongest and best album to date; it has such a wonderful, musical vibe. It also has its own, distinct feel. NE: Thank you. I’m really happy with it, Ross, and the record in itself was part of a broader, reinvention of my life – a remix of my life, if you will – that resulted in a lot of very positive things. And I’m happy to report that on the heels of writing and recording Treehouse I have enough material for another album! RM: Great stuff. The other thing that strikes me about Treehouse is it's almost two halves, or musical shades, of Ned Evett. The album starts with up-tempo, electric guitar numbers before moving to lighter, more acoustic material; it then finishes with a rocky brace including the excellent closer, Don't Despair. That whole sequencing scans, and works, really well. NE: Well I appreciate you noticing and that was intentional. We wanted to get people moving at the top and then it goes sort of a little deeper into the story-arc in the middle, with the more acoustic stuff, and then we bring everybody up and send them off with a nice end, you know! NE: The sequencing of the album was one of the last creative decisions we made so it was definitely intentional and I’m very happy with it. Of all the records I’ve done I’m the most satisfied with Treehouse, on every level, and that includes the sequencing of the songs. RM: Yes, individually each song has merit but collectively there is cohesiveness to the whole concept. And the album was recorded in Nashville, which must have played a part in that Treehouse vibe. I would also surmise being born in Nashville means you must have that Nashville music scene within your genes? NE: Yes, but my family is also very musical. My mother is an opera singer and my dad is an English teacher but also a musician, a piano player. But yeah, I’ve grown up around music my whole life and Tennessee [pauses]… when I really needed it Tennessee was there for me, these last couple of years, so that’s been really nice. NE: It is a perfect fit and not only is he another fretless guitarist he is the individual that I got the idea from originally, back in the eighties when I saw him playing with King Crimson. He was playing fretless guitar on one song and I thought "wow, wouldn’t it be cool if you could build an entire style off of that one thing?" RM: So that’s where it started? RM: That is pretty cool. So Adrian was genuinely an influence and inspiration, certainly from the fretless guitar side of things? NE: Yeah, but I always like Adrian and I always liked his music. Of course I always liked his guitar playing a lot, but I also liked his solo work and the way that he fronted King Crimson. So yeah, I was definitely a fan. RM: Having mentioned how and when the fretless guitar started for you I'd like to go back a little further and talk about classical guitar. You were playing classical guitar at sixteen and had the opportunity to pursue that quite seriously, but you took the rock and roll road. What made you push off in that direction? One of the reasons that I gave up classical guitar was because of the footstool! When you play classical guitar you actually have a footstool and it raises your foot up, about six to eight inches. And that is what you do – if you play classical guitar you play with a footstool. That's the technique, but it hurt my back! It messed my back up so much, even at a young age, that it got to the point where if I had a six or seven hour practice session, which is required if you want to be a classical guitar player, I couldn’t do it! happened if it wasn't for an uncomfortable footstool. RM: I read that you hand-built your first fretless from, literally, the neck down, because you only had the neck left after you destroyed a guitar on stage. Is that a true story? NE: It is a true story. I really try hard to make sure the anecdotes that are put out in my press actually happened! I had a Squier Stratocaster and on New Year’s Eve of 1990 I was at a gig where I was playing in a band with a friend of mine. And it was the band’s last gig so it was very emotional – the band was breaking up, everybody was bummed, we got drunk and we engaged in some smashing of the guitars at the end of the night! I smashed that Strat and the body broke in half; the body was toast but I had the neck, so I took a Basswood body from a guy named John Bolin who builds guitars for the Rolling Stones and Steve Miller. I pulled the frets from that neck and attached it to that body, put some pick-ups in, and I had that guitar in some form or another for four or five years. And that was the first fretless. And the second I strung it up and played it… well, believe me, it barely played [laughter], played is an overstatement, but it just hooked me - the second I did a couple of fretless notes I knew this was something I wanted to do for the rest of my life. RM: Wow. Wonderful story and that guitar certainly paid dividends, no question. From your own perspective Ned, as regards technique, what are the differences between playing a fretless and a more traditional, fretted instrument? NE: Well, the main difference is it’s kind of like playing slide guitar with your fingers - instead of using a bottle-neck you use your fingers. RM: …almost an industrial sound. NE: Yeah, so it’s very clear. Now, when you play fretless guitar, you’re talking about the flesh of your finger pressing on a string on to a glass fingerboard – in my case. So actually three things are generating the tone. And it has an interesting blend of both sharp and muted characteristics, so that’s where the tone is coming from, that interaction, those three things. And beyond that, instead of on a piano where you have a white key or a black key, all of a sudden you can get in between those notes. With any sort of fretless instrument, or slide, you get in between those notes. But, as I like to tell people, you can only be so accurate and that’s where the interest comes, in that nuance of pitch. RM: That’s interesting, because it sounds like playing the fretless guitar properly has the same sort of philosophy behind it as singing properly. Somebody can be an extremely good singer but if you miss that pitch, even slightly, and you are flat or sharp on the note… you really need to know what you are doing to get the best out of the fretless instrument and the vocal instrument. NE: It is very vocal and there’s a sort of... gestalt to it, for lack of a better word. And you’ve got to have some balls to do it, because, you never know! [laughter]. Of course you can practice the thing to death but, at the end of the day, it is very much like singing, I think. RM: And as we mentioned earlier there’s such a wonderful tone and colour to a well played fretless. NE: Yes! I started doing the glass – and this is also how I’ve become known as "the glass guitarist" – because I kept wearing out my ebony fingerboards that I used on my first round of fretless guitarists after I built the initial prototype. The metal strings chew right through wood, so then you hit a problem, because it starts to buzz, and you can’t play the guitar any more. You have to get it re-planed. And that's very expensive. So I started using the glass fingerboards because once you cut them and put them into place, the glass is harder than nickel steel, so the nickel steel strings just slides over the top and doesn’t have any effect on it. NE: Well not only that, it’s also my main guitar live. The Globro is very durable, I’ve had it on the road since 2003 and it’s still just a beast. And, you know, I keep a watchful eye on it and I look forward to playing it for as long as I have it in my possession. RM: Hearing you say it’s such an important guitar to you makes me immediately think of Steve Howe. Do you have the same sort of possessive feelings for The Globro? NE: Well, unlike Steve Howe, I don’t have the budget to buy a seat for my guitar [laughs], but I do have a really good system for flight packing I call the Space Capsule, because it literally is. Well, it’s an SKB golf case and I pack two guitars in it, but my theory, Ross – and you might appreciate this if you play golf – is that the airlines treat my case with more respect because it looks like a like a golf case! NE: Really? [laughs] That’s amazing. What position did you play? RM: Receiver. This was in the British American Football Leagues and I played for four years before coaching for another two. We like to think we did our bit to help pave the way for what is now a high interest in the NFL. This all ended twenty years ago but I still miss it like the devil. Age and physicality tell you when it’s time to hang up the helmet and pads, though. NE: Oh, I know that’s true [laughs]. I was sitting watching these Olympic athletes earlier and some of them were saying their careers are over when they are twenty-five. I’m like "oh that’s tough, man" [laughs]. RM: I must admit I’ve been enjoying the Olympics myself, especially the athletics and the cycling. I take it you’ve had a chance to do some sight-seeing while you have been over? NE: Yeah, I’ve been able to do a lot of sight-seeing and we actually just did the White Cliffs of Dover. RM: I'd like to play another song from Treehouse and feature you acoustically. NE: "Mars River Delta, 2128, ten men came looking for me and one man walked away…"
RM: That’s the very guy [laughs]. NE: Well, I’ve always liked archival recordings and I’ve always enjoyed the Smithsonian Folkways and grew up with quite a bit of folk music. And English folk music as well which, of course, pre-dates American folk music by leaps and bounds. However I’ve always been resistant to doing archival recreations of my own where I’m singing about, you know, the Spanish flu virus of 1918 [laughter]. That’s not my thing. I wanted to do something different. I wanted to write a blues song but still capture some of that context; just not have it set back in the 19th century or early 20th century. So instead I went way out [laughs] to 2128! I also wanted to do something that was this complete story and, I’ll be honest with you, sometimes these stories, once you start it, they just kinda come to you – and where they come from I don’t exactly know! But song writing is a wonderful short-hand, you can say so much in a three minute song. NE: I grew up around a lot of mining as well. I lived in a mining town for a summer in Atlanta, Idaho and have seen dredgers and sluices my whole life – the sort of dinosaurs of this industry. I was born in Nashville but grew up in the Rocky Mountains and mining is everywhere there, it’s a resource based area - as a matter of fact it’s one of the richest rare earth mineral areas in the world, so molybdenum was something they routinely extracted up in the north. So my familiarity with that world certainly influenced the creation of Mars River Delta 2128. RM: That’s a great insight into the story and history behind the tune. And from your songs to your six-string talents. You have been described as one of the world’s foremost fretless guitarists and Joe Satriani has referred to you as a "monster player." That has to be extremely gratifying but does it put any additional pressure on you? NE: No, and this is the thing: I’ve been really lucky to meet some of my heroes and one of the rules that I made with myself when I was growing up is that I was not going to be an imitator. In my opinion, if somebody inspires you to make music you should pay them the most amount of tribute by doing your own thing. So even though Adrian is a huge influence on me and Joe was a big influence on me as well, in his own way, I don’t sound like either of them. And the reason for that, as I’ve always believed, is that if I ever got to meet them some day is I would want to be able to say "Hey, you really inspired me, so I took what you did and I did my own thing with it." And that was how I got out of the eighties! [laughs]. RM: Well it has certainly worked for you so far and it will be fun to follow you down the road to see where future musical paths lead. And on that – what’s the next couple of musical steps for Ned Evett? NE: I need to do a US Treehouse tour, because the record was very well reviewed there; I need to see to that. And at some point after that I have this material for a new record and I’m tipping my hat currently towards a record that is stylistically similar to Treehouse, but might be a little bit less produced. I’m fooling around with the idea of there not being any electric guitar on it at all, because I have this new acoustic. It’s a '63 Stella, steel string, fretless, called the Golden Gate. So I’m really excited about making a record with my percussionist, the key resonator guitars and that new steel string. And maybe an upright bass player, something like that, but I’m really looking to do something that will capture… a photograph, as opposed to building a ship in a bottle. RM: I would very much look forward to that, something from you that's based solely around acoustic instrumentation. In the meantime I'd like to return to Treehouse and would ask you to pick the song we play out on; perhaps a particular favourite or one that has some personal significance? NE: Well, currently, I really like Sayonara Serenade and that’s a song about saying goodbye. I co-wrote it with my eleven year old son. He wrote the riff and I fleshed it out and wrote the lyric, so I really love that song - and it gives me the hope that someday I’ll be able to bring my son over here to the UK and show him around and show him all this cool stuff I’ve been seeing for the last ten years. RM: And here’s to the next ten. Ned, this has been an interesting and fun chat. Thanks for dropping in on FabricationsHQ. NE: Thanks so much Ross and, again, I hope that we can put Scotland on the tour map next time I come over! RM: Absolutely. Not so much "Sayonara" as "See you later…"
Photo Credits: Gregg Roth (including album cover); White Cliffs photo by Sandra Prow. Audio tracks presented to accompany the above article and by kind permission of Ned Evett.